Jake Verzosa (b. 1979, Tuguegarao, Philippines) spent his childhood in the rural capital of the Cagayan Valley Region. His hometown hosted frequent visits by townsfolk and tribes from Isabela and Kalinga who regularly descended to trade goods and acquire supplies. Verzosa’s parents were practicing physicians. His father, who took an interest in photography, introduced him to the processes of the dark room and gave him his first camera, a Nikon FE2. Verzosa pursued photography professionally in the year 2000, shortly after the birth of local glossies and towards the boom of print publishing. Fashion editorials provided an exciting new platform for art directors and photographers. As lifestyle titles were quickly growing in number, the industry developed a new breed of creative talents. In the beginning, Verzosa divided his time working as a programmer and shooting assignments on the side, until deciding to take up the lens full time. Shooting celebrity covers and fashion spreads, Verzosa was quickly recognized for how his portraits drew out the subject’s mood and character. Unlike other photographers who highly directed their subjects, Verzosa would give little to no instruction, allow his subjects to ease into natural positions and quickly get the shot. Prompting his foray into long-form visual narratives were Workshop Asia in Luang Prabang (2007) and Angkor Photo Festival in Siem Reap (2008). During these workshops, Verzosa pursued photo stories documenting local life under the guidance of veteran photographers such as Philip Jones Griffiths and Jack Picone, both noted for their coverage of war and conflict. These introduced him, as he put it, to “the slow process of pursuing a story,” and to the dual notions of the photograph as document and as art object—a division he intends to reconcile to this day. 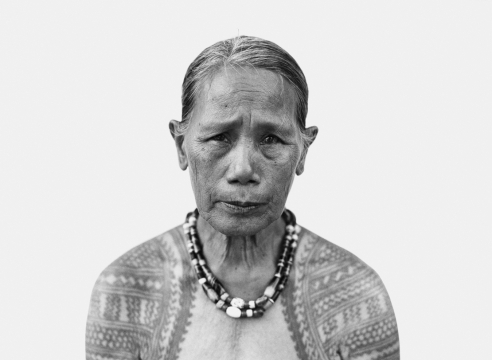 For his series “The Last Tattooed Women of Kalinga,” Verzosa spent three years hiking to different villages in the highlands, taking the portraits of elderly women and their fading tradition of tattoo-making. Mounting a makeshift studio, he would note how the slow setup of a Pentax 67 led to chance shots of more natural expressions. 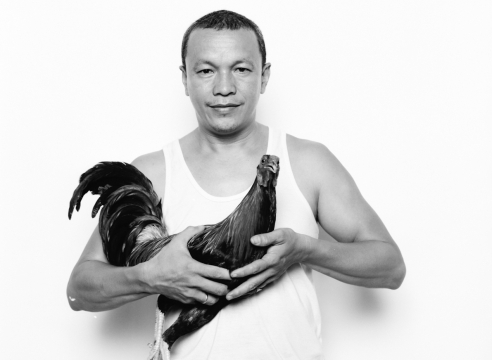 His black-and-white treatment lends visual uniformity and highlights graphic detail. As French curator Francois Cheval noted, “There is no need to add (color) as the vital power of the forms appearing on the map of the body is expressed by lines and abstractions,” details that denote “belongingness to a single whole.” His photographs were compiled in the book of the same name, first published in 2014, and was then chosen by publisher Gerhard Steidl for the Steidl Book Award Asia. “I am interested in the vernacular,” said Verzosa, “how a certain series paints a portrait of a community or a country.” A frequent traveler, he would pursue the same subjects across years and locations: lone hoops towering over empty basketball fields, punks encountered during years of covering concerts, members of the Manobo tribe, cockfighters, twins proliferating in specific locales. For him, photography is akin to the act of collecting. Bernd and Hilla Becher’s practice of illustrating a social concept through photographing a large number of examples would influence his work. He applied the practice through portraiture: framing individuals, in the attempt of framing the larger narratives they belong to. 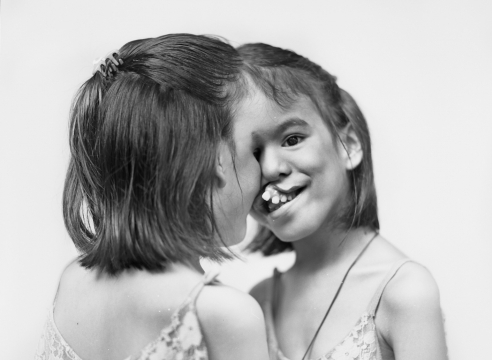 Verzosa’s photographs have been exhibited in Denmark, France, Japan, Korea, Netherlands and Singapore. He is currently based in Manila where he collects cameras, books, and motorbikes. Casal, Chang. “A rare glimpse at the tattooed women of Kalinga.” CNN Philippines Life, April 2, 2018. Cheval, Francois. Foreword to The Last Tattooed Women of Kalinga. Gottingen: Steidl, 2018. David, Tammy. “Photo Essay & Invisible Interview: Fatherhood, by Jake Verzosa.” Invisible Photographer Asia, October 17, 2011. De Leon, Pristine. Researcher’s interview, 30 July 2018, Pioneer Studios, Mandaluyong, Metro Manila.